Video poker players at Intertops Poker and Juicy Stakes Casino can earn bonus prize money by competing against each other in the $2000 Lucktap Video Poker Leaderboard Contest. The week-long contest starts today. September 5-11, players will earn points for two pairs, three or four of a kind, Straights, Full Houses, Straight Flushes and Royal Flushes. They’ll be ranked by their points on a leaderboard and the top thirty players will win $2000 in bonus cash. The player with the most leaderboard points will $300. Second prize is $200 and Third pays $100. Two Pairs earns 1 point. Three of a Kind is 5 points. Straight earn 20 points, a Flush is worth 25 points, a Full House gets 35 points and Four of a Kind wins 50 points. A Straight Flush wins 100 points and a Royal Flush is 300 points. 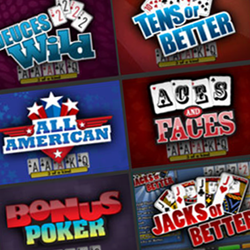 Players will earn leaderboard points playing any Lucktap video poker game: Jacks or Better, Deuces Wild, Tens or Better, Bonus Poker, Double Bonus Poker, All American, Aces and Faces, Joker Poker or Double Joker Poker. Well-known for their active online poker rooms, Intertops Poker and Juicy Stakes Casino also have a huge selection of slots and table games from Lucktap, Betsoft and World Match.